These Quarter Pipes are so Phat!!! Awesome for Skateboarders, BMX Bikers, and Inline Skaters! Our Pipes are nearly half the cost of our leading competitors', making ours the clear choice. 1. Heavy duty steel is lower in maintenance than wood. 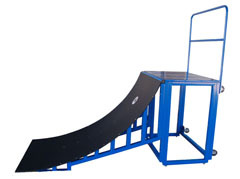 SkateboardRampsAndRails cannot extend the 30-Day Satisfaction Guarantee to Quarter Pipes due to the expense of the item. Rest assured that the product still has a 1-year warranty against manufacturers defects. Please take a moment to click on our sponsor's links above and compare. Our products stand head and shoulders above the rest in price and quality. Customer satisfaction is our top priority. If you have an issue with any of our products, please call us immediately for assistance.